1. Accented characters are now composites, which significantly reduces the size of the font. 2. The cent sign, which had a winding problem which several people pointed out to me, has been properly rendered. 3. The word space, which people have also complained was too small, has been slightly enlarged. However, because this is a display face designed for large pointsizes, the wordspace is still substantially tighter than fonts from other commercial vendors like Adobe or Bitstream. 4. The register and trademarks have been shrunk to proper size. This is the TrueType version for the PC (a PostScript Type 1 version is also available). I don't know too much about TrueType and less about the PC, so please bear with me. This font was generated on the Mac using Altsys' Fontographer 3.5.1. If you run into problems, let me know and I'll see if I can get them fixed (at the very least, I'll send you the Type 1 font). Middleton is an unabashed knockoff of Florentine, a display face created by R. Hunter Middleton, the former director of type design for Ludlow. During his lifetime, Middleton created some 90 faces primarily for the advertising community, including the popular font family Radiant and the first true serif/sans serif hybrid, Stellar. As far as I have been able to determine. Florentine is a registered trademark of T.J. Lyons, which in turn has licensed the face to a variety of vendors such as Linotype and VGC, although none of them have released it in PostScript format. Middleton is freeware although the following restrictions apply to its distribution: this font can be freely passed along to other users as long as it containes all files, including this READ.ME message. On CompuServe, Middleton is available on the DTPFORUM exclusively. Other bulletin boards wishing to upload the font should contact me for permission. It is NOT to be included on shareware collections sold for profit. I dislike seeing my work lumped in with sales pitches that promise "Over 200 megs of fonts!" I don't have a huge legal staff, but please respect my wishes. 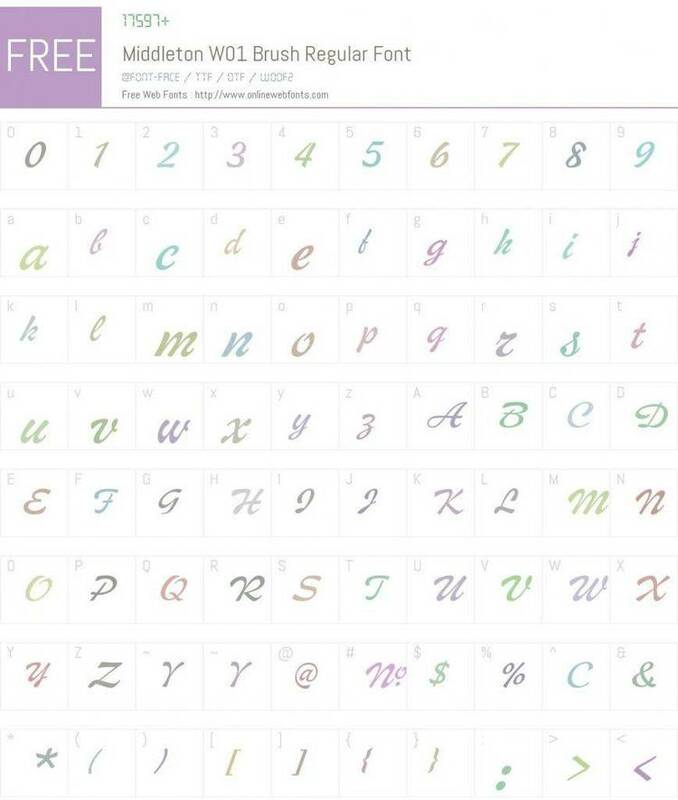 This font is intended to be shared among the telecommunicating typesetting community -- primarily those who also give, either of their programming or design talents, their knowledge or simply their sympathy when someone encounters a print production problem not easily solved from the desktop. Back to business. Middleton includes some very nice alternate characters. Since I don't have a PC running Windows, I have no idea how they are accessed, but if everything went well you should be able to locate in the character set the following alternates (A, B, E, F, M, N, O, P, R, S, e, o, and y). There's also an open ballot box and Brad the Wonder Penguin kicking around the font. According to documentation from Altsys, generating the TrueType font may have resulted in the loss of all kerning pairs, so the AFM file is included (I'm assuming there is some way of loading kerning pairs into a PC TrueType font from an AFM file). Again, my apologies for my PC ignorance. I'm hoping John Cornicello, PC sysop on Compuserve's DTPFORUM, will sort some of this out. If he does, my thanks to him. If not, he is definitely not to blame. Middleton is released in memory of Michael DeCrescente, the former general manager of Characters Typographical Services, Inc., who died of cancer in 1989. A contribution to the American Cancer Society is always appreciated.